I was going to try an all-organic diet, but I’ve decided that Homer Simpson was right. Donuts are good. Burgers are good. What could be better? 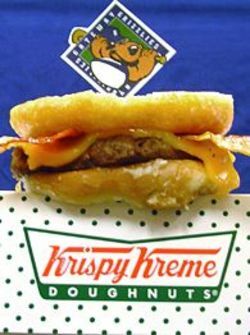 How about the Krispy Kreme Burger at the Gateway Grizzlies baseball games? The minor league team is located outside of St. Louis and sells this gut buster as a promotion. The same formula has been applied as the Luther Burger at Mulligan’s in Decatur, Georgia. It was named after Luther Vandross, however it was unclear if he ever ate one. Much to our horror, the pink flamingo lawn ornament was pronounced dead. It was reported that Union Products Inc. stopped producing their original pink flamingos and other lawn ornaments at its Leominster MA factory in June, and was going out of business Nov. 1 due to rising expenses for plastic resin and electricity, as well financing problems. They had produced this american icon for nearly 50 years. This caused a rush to the stores by the flamingo fanatics to salvage what they could before the market dried up. The classic flamingos disappeared from the shelves. But then something unexpected happened. A new owner is stepping in to resume manufacturing and bring these precious birds back to life. On the surface, this appears to be spectacular news…. but it raises bigger concerns. 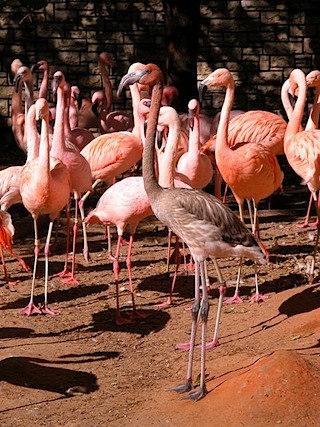 Will the flamingos return in the exact image of the original Featherstone design? Or will they rise as the feathered undead to terrorize our neighborhoods. If you have flamingos in your lawn (which I’m sure you do), you may want to make sure they are chained to a tree. Some of you will scoff at this warning, but if they eat your brain, don’t come crying to me. Read the 6-1-2007 USA Today article here about the buyout. Remember Hogzilla? Well, there’s a new king of swine. 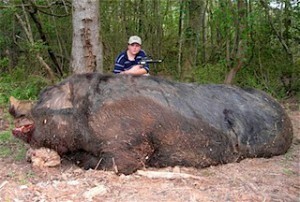 Check out this monster pig gunned down by an 11-year old boy named Jamison Stone. The big was shot by the boy in the head 8 times in south Georgia. It was reported to be 8-12 feet long and 800-1000 lbs. The statistics vary on the version you read. More info can be found at their family Monster Pig website. The site has returned and has been overhauled. The old photos and web tours have been archived, but may return someday. I hope you enjoy the new site.